From being smart with scale to multitasking with furniture – how to create a space that works for you. WE OFTEN ASK our living rooms to fulfil a number of different functions. It may be used as a TV room, a playroom, a home office, somewhere to listen to music, a place to indulge our hobbies, or perhaps even a guest bedroom. That’s a lot to ask of any room, but the challenge is even greater if we are working with a small area. Thankfully, there are plenty of ways we can make the living room work harder for us, yet still feel relaxing and cosy. To do this, we need to be efficient with the use of space and use decorating tricks to create the illusion that the space is larger than it actually is. The important thing is not to focus on the restrictions of the space, but to look at it as an opportunity to use clever design. 1. Be smart with scale: Choose smaller versions of furniture so that each piece will have room to breathe rather than feel crammed. Furniture showrooms are vast spaces and can be misleading, so be prepared with your room measurements when you go shopping. However, it’s not all about size: your furniture should also be an efficient use of space. For example, armchairs offer little seating for the space they occupy, so consider a slightly larger cuddler chair instead, which is designed to seat two people. DFS stores nationwide have some great options, such as this Zinc cuddler available in fabric or leather finishes. Darker evenings are the perfect excuse to stay in and get cosy. Our Zinc cuddler was made for snuggling and is perfect the job. Find out more on our website, link in bio. 2. Think vertical: Where square footage is limited, it’s a good idea to make the most of your wall space instead. Built-in or free-standing bookcases and entertainment centres are a great way to make use of awkward corners and offer practical storage as well as an opportunity to add some character to a small space. Doors can hide away everyday unattractive items, whereas display shelves enable you to showcase your favourite objéts. You can even go half-and-half and get the best of both worlds. Browsers in Limerick and The Orchard in Celbridge are stockists. 3. Make your furniture multitask: Choose multi-purpose furniture that offers greater flexibility – such as a coffee table with built-in storage, a sofa bed, or an ottoman that can act as either a coffee table or extra seating as required. Here @tinyinteriorz, whose Dublin home is less than 25 square metres in total, uses the Norden gateleg table from Ikea as an end table. It can be extended to make a larger table when needed and even includes six storage drawers underneath. 4. Spread the light around: We often overlook the importance of lighting in a room, but to do so is a missed opportunity. If we spread light sources around the room, it not only provides a more pleasant ambience and more practical lighting for working on different tasks, but it also makes the room feel bigger by highlighting and drawing the eye to different areas that might otherwise fall into relative darkness. Consider adding wall lights or picture lights, position a standard lamp in the corner, or place a table lamp on a sideboard. Ruth @ruby.aimee does this to great effect in her Co Mayo home, below. Find similar lighting at Debenhams nationwide. 5. Think outside the box when it comes to storage: Using items for an unexpected purpose gives a small space more visual interest. Stack vintage suitcases or use large lidded baskets as end tables. Ciara Rees, proprietor of the online home accessories boutique Rees & Hunt, uses a trunk as a coffee table that provides attractive-looking extra storage too. You could also try using an antique chest. The Gaiety, near Westport, is a perfect place to find such treasures. 6. 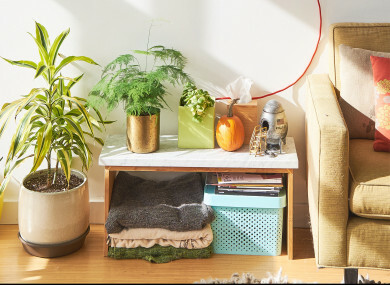 Blur the boundaries: Plants are a great way to add texture and to soften the edges of a room. Placing them in corners makes the space feel less boxed-in. Abbeyfeale-based interior designer @wioleta_kelly demonstrates this beautifully above, but fear not if you don’t share her green fingers as Lidl nationwide have a special offer on faux plants this week. Email “Think vertical: 6 design suggestions to make the most of a small living room”. Feedback on “Think vertical: 6 design suggestions to make the most of a small living room”.